In order to link to Louisiana Kitchen & Culture from any of your web pages, simply copy the version below that you prefer and paste it into any web page on your site. 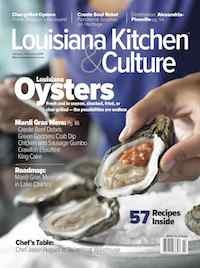 To add the Louisiana Kitchen & Culture link to your web site please choose either our Link Banner, Text Link or Cover Image. You may alter the link to suit your site design. 1. Text Link - to include the following text link in your page. 2. Banner Link - to include the following banner link in your page. 3. Cover Link - to include the following cover image and link back on your page.